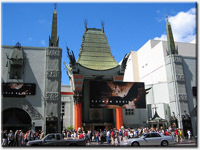 20-th Century Fox Worldwide Movie Premiere - "Rio" in Hollywood! On Apr 10, From 1:00 a.m. to 9:00 p.m.
International visitors are welcome to visit Hollywood boulevard to participate in the event. Westbound lanes of Hollywood Blvd., between Highland Ave. and Orange Dr., will be closed. Additionally, the south curb lane, north sidewalk, the mid-block crosswalk, and the Orange Dr. crosswalk, will be closed intermittently during this time.